Honda's announcement that it was returning to 500cc grand prix racing in 1979, after an absence of 12 years, caused less of a sensation than the news that their GP contender was a four-stroke, at a time when two-strokes seemed to rule GP races. Moreover, it quickly became apparent that this engine was really an eight- cylinder whose pistons had been "welded" in pairs to meet the rule prohibiting more than four cylinders in the 500cc class. In fact, the pistons and bores had a cross section like a rectangle with semicircular ends. This ploy allowed the engine to run at over 20,000 rpm, producing a power output equivalent to that of a two-stroke. And that wasn't the only original feature of the machine: its 16-inch wheels were something new at the time, as was its front fork with external springs and its lateral radiators - which even as late as 1992 had not been adopted by other makers. Nothing like its streamlined light-alloy monocoque exoskeletal frame has been seen since. 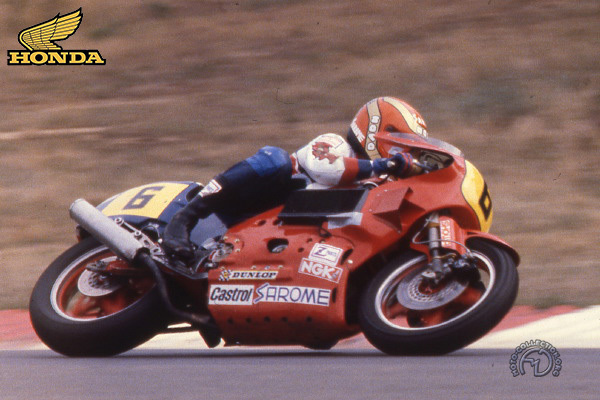 Despite all Honda's efforts, the career of the NR was a fiasco, which led the company to create the NS, a two-stroke three- cylinder that Spencer rode to the world title in 1983. Nicknamed "Never Ready," the NR continued as a test vehicle long after its racing days were over. Takazumi Katayama rides the Honda NR in its first race, the 1979 GP of France.